"Watson wrote the story...but he changed the ending"
The film may be slow-paced and actionless, but the drama surrounding the mystery of the case is moving. The characters are well-acted and the plot is littered with intriguing revelations. And yet, there is still humour to be found. A moving and engaging tale about a detective we all know trying to fix the wrongs of the story of his last case. As you'd probably expect, there are no action sequences nor thrills with this film. But there's a constant sense of curiousity that keeps audiences engaged. Holmes' last case is shown in flashbacks, as we follow the present 93-year old Holmes trying to recall the details of his last case. And while it may feel frustrating that we need to wait as Holmes tries to recall the next details, the segmentation of the flashbacks are properly laid out...and better yet, each time it ends with quite the cliffhanger - such that we can't wait to find out what happens next. 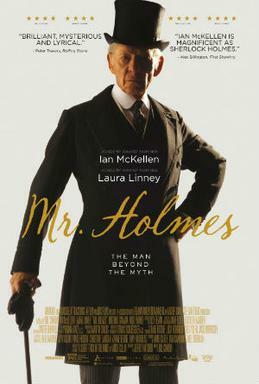 The events that happen in the present pales in intrigue as compare to the more interesting flashbacks, but we find ourselves caring for this young boy Roger, who has a fondness for Holmes, and vice versa. The chemistry between the two is brilliant, and it further allows for the conflict at hand with housekeeper Mrs. Munro to be more significant. Despite less interesting events unfolding in the farm, we care so much for Holmes & Roger. And we also find some of the humour in these scenes, as we hear witty conversations take place. Apart from that, the major aspect that keeps us engaged is our eagerness to find out what really happened in the past, as we root for Holmes to recall the story that Watson so wrongly changed. The truth excellently unfolds (very slowly indeed) but is occasionally accompanied by a similar theme or a specific object from the present. And then, what is more beautiful is when we find out the true story, its repercussions, as well as how it changes Holmes in the end. Despite its slow pace and lack of action, it still is a well-crafted, intriguing & moving tale of a familiar character we find ourselves invested in.